Hello lovely people, have you been to any fireworks parties this week? Little man absolutely loves them (he’s not yet 3), all the colours and patterns in the sky. I’ve been trying to think of some crafts we can do to go along with them (last week we collected autumn leaves and made a leaf picture). My favourite is the classic of black paper and chalk. Anyway, I digress, I hope you have been enjoying the change in the season and have drunk lots of soup and eaten lots of jacket potatoes (takes me back to the fireworks parties of my youth!). Back to what I meant to blog about. I have a friend who is expecting (ok, I have quite a few friends that are pregnant, but this lovely lady is due very soon). Anyone who follows me on Twitter will know that I finally finished her crochet Buggy Blanket. It took me ages! I loved making it though. Would you like to see it? She doesn’t know what she is having, so there is pink and blue woven into this colour scheme, but I don’t think it matters. What you don’t know is she loves rainbow colours. When she got married these were the colours she chose for her colour scheme. I saw them on a market stall when I was on holiday this year in Devon and knew that they had to be into a blanket for friend’s baby. It’s designed as a buggy/car seat blanket, and I think there are a couple of things that can be more for Mummy (changing bag being another, I mean who cares if a Mum with a little boy turn up with a flowery changing bag?). Still I hope she doesn’t mind the colours! I actually used an acrylic wool (oh I can here the groans! Bear with me I have a reason, I promise!). I chose this wool particularly because, in my experience, it’s good to have a buggy blanket that you can throw in the wash as much as you like; that muddy water practically rolls off (not to mention anything else that might end up on it); and you don’t mind throwing in the back of the car/buggy/bag etc. I used 3.5mm hook with DK wool and 5 different colours. 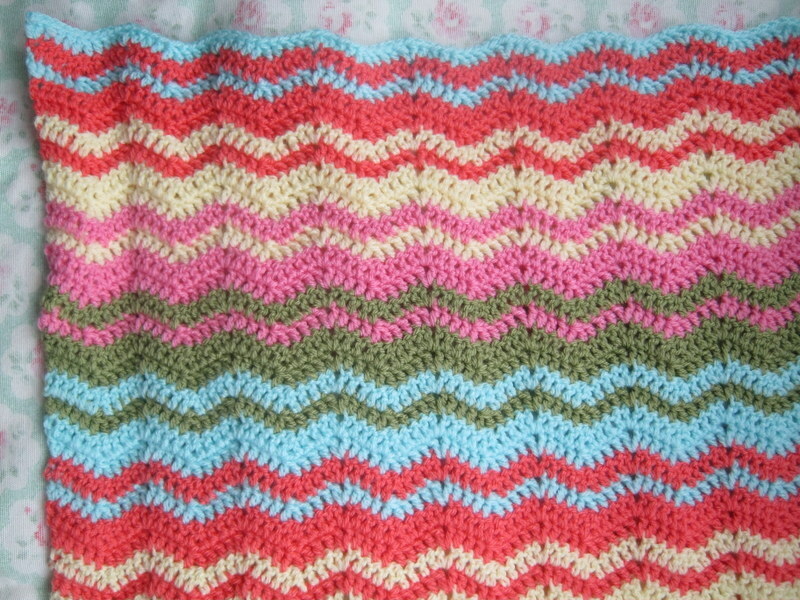 For my blanket, I made a 111ch but for a bigger one, add 12 ch for each ‘wave’ you want to add. If you want to add a boarder then take off at least one 12ch ‘wave’, depending how big your boarder will be. Row 1: 1tr into second ch from hook, 1tr into next ch, *1tr into ch of next 3 ch, tr3tog over next 3ch, 1tr into next 3ch, 3tr into next ch*. Repeat *to* until you get to the end (with one ch remaining). 2tr into last ch. Row 2: 3ch, 1 tr into first st. *1tr into st next 3 st, tr3tog over next 3st, 1tr into next 3st, 3tr into next st*. Repeat *to* until the last 3st. 1tr in each st and 2tr into top of turning chain. Repeat Row 2 until the blanket is the length you want. Of course you could do whatever stripy pattern you fancy! As I was working this out as I went along, it took me a couple of rows to work out that you get a better ‘hole’ if you crochet into the chain space from the previous row and not into the chain (I know, it should be obvious). I’ve never been good at following patterns, hence why, after making my massive sofa blanket earlier this year, I just decided to try my own thing. I have been inspired a lot by the lovely work that Attic24 does and first saw the blanket with the small holes there (I have since seen it all over the place, it’s a classic, in fact the ladies at one of my ‘knit and natters’ have been doing it since before I was born). 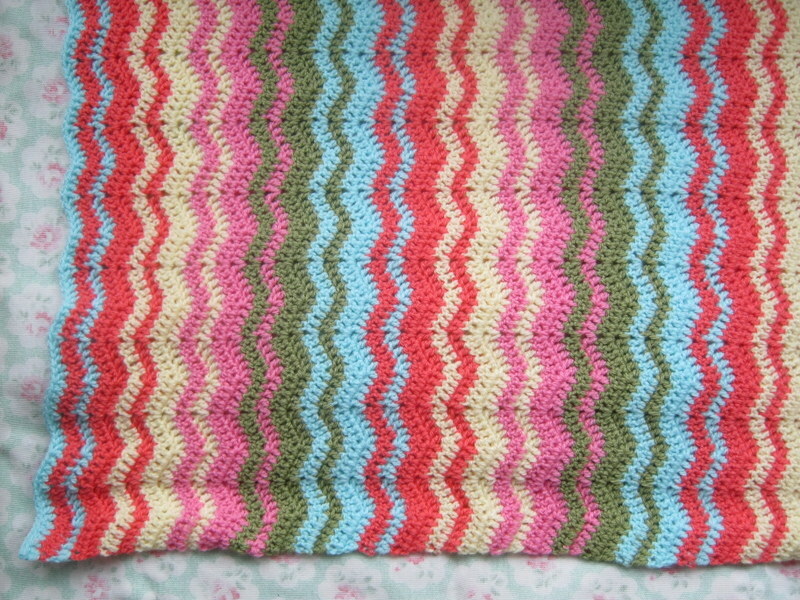 Anyway, I saw it and thought, ‘that looks really nice, I’d like to give it a go.’ I deliberately didn’t look at how she coloured some of her wavy blankets, as I wanted to come up with a colour scheme/pattern of my own, but it may well look similar to a couple of her wavy blankets (they are much more beautiful though, seriously you should pop over and have a look). To work out my colours and because I’m much more of a visual person, I actually drew a few ideas on a piece of paper, coloured them in (you still need coloured pencils when you are an adult!) and then chose which one I liked best (this is something I learnt from doing my big blanket, I really should have done that then and I didn’t – learn from my mistakes people!). In the end I decided on the 18 Row pattern above, as my favourite. I hope you enjoyed my little pattern. Happy crocheting!